Held in Southport, England, the 2007 NABBA Universe Men at the Evening Show also includes the complete judging of the Pro-Am class. You will see the posing routines of all top 6 amateur competitors in all classes plus all Pro-Am competitors. Includes posedown for overall Amateur Mr. Universe won by SALVATORI ORAZIO, plus all awards. The Pro-Am winner was also SALVATORI ORAZIO making it a double. He made history by being the first man to win both titles on the same night. Of special note was Juniors winner Daren Borg of Malta. 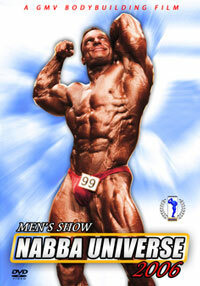 Daren also won the Junior Class at the 2007 NABBA Worlds making it the double for this year. The outstanding winner of both major titles, SALVATORI ORAZIO of Italy, is pictured on the front cover. The Pro-Am class is contained in its entirety in this evening show DVD. For details on the Men’s Prejudging which is PCB-682DVD, please click here.